Marcia Herman, Ellie Goldstein and their dogs take their daily walk. Photo courtesy The Hamden Chronicle. To thoroughly enjoy a walk, a few essential preparations and insights are helpful, beyond carefully leashing up the dogs and heading out. Being aware of the surroundings is a necessity. True, always looking around may take away a bit of the pleasure and relaxation we seek, but being aware of one’s surroundings is vital to seeing what is up ahead or behind or to the side and to staying safe. Unfortunately, sometimes we have to be ready to take certain defensive actions that go against every fiber of our logical human impulses. Some of these actions directly relate to how differently from us dogs think and perceive the world. An incredible book by Patricia B. McConnell, PH.D., titled The Other End of the Leash, brings to light that dogs are far more complex beings than we ever realized. Much about subtle dog behavior and emotions is covered in the book; the material is presented in plain English and the information is unexpected and very different from most classical dog behavior and training books. Ms McConnell is not theorizing but draws her conclusions from years of working with dogs, watching tapes, and analyzing relationships between many animal species, not just between humans and dogs. This book is an eye-opener to even a long-time dog owner. To summarize in part, McConnell says that dogs are exquisitely adept at reading the finest changes in body language and their meanings. If dogs detect the slightest “off” signal, their behavior will change in a flash. Body language and eye contact or lack thereof means much to them, and astonishingly, it applies even to the mundane activity of taking a walk. Yet a fun walk can still be a new adventure a day, a challenging hike, or it may be a jaunt on a route as familiar and as comfortable as an old walking shoe. Regardless of which kind of walk we take, we know walks are never alike and that every walk presents something different. The unexpected differences make vigilance important, especially if walking on the road. Nowadays, people behind the wheel seem to be in a rush more often than not; they drive 60 in a 30 MPH zone, often while using their cell phone, eating, and even reading. The safest action is to walk facing the oncoming traffic to keep an eye on drivers who are not likely paying much attention to us. Vehicular traffic is not the only unpleasantness we might encounter. Hapless homeowners who sometimes let their dogs out of their houses to do their business unleashed in their unfenced front yards just as we are passing by are particularly vexing. Other individuals are walking their less-than-well-trained dogs off leash. All these folks are the ones who are convinced their dogs are friendly and are quick to tell us so. The results are predictable. Before they have finished the sentence, their dogs have charged us and our multiple dogs. (What are they thinking anyway?) These owners either laugh nervously or are so taken aback they stand frozen in shock, while we are left alone fending off their “friendly” dogs. Being aware of the possibility of loose dogs in the vicinity gives us the opportunity to quickly change our route mid-walk or to get out the pepper spray if the unfortunate happens and we must use it. The safest actions – and some of the most counter-intuitive ones – are to not look the charging dog in the eye and to turn around and go back the direction from which we came if far enough away to do this safely. By doing this, the dog may still be on its property and may not feel the need to defend it. Most of all, we tend to think that dogs will stop where the yard meets the road. Alas, most dogs don’t screech to a halt when they reach the grass/road line, not even some dogs that are in a yard “protected” by invisible fencing. Sometimes a quick “ah, ah!” may distract if we are about to get physically engaged. Once we learned to deal with the possibilities by being observant and prudent, walking became fun and beneficial to everyone’s health. Walking a couple of miles a day at a moderate pace is actually a marvelous way for us and our Greyhounds – even elderly ones – to stay in fine shape. Walking keeps the dogs looking like the athletes they were bred to be. 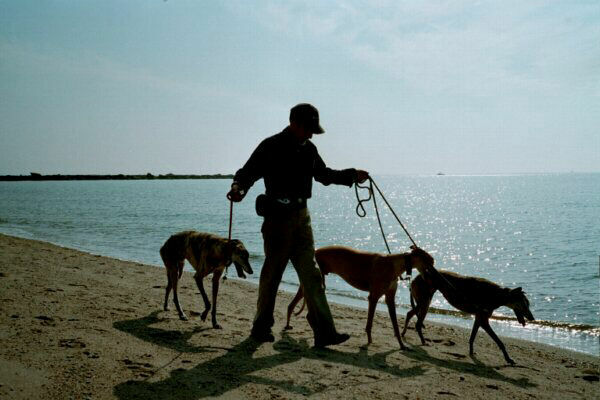 Greyhounds love to walk; we take advantage of it. Over the last 25 years, we’ve had our share of close calls, injuries, and even a death on our daily (weather permitting) constitutionals. One incident – being struck from behind by a car whose youthful driver didn’t see us in the glare of the setting sun – has made us particularly vigilant of walking safely and observing one safety rule in particular: Walk facing the oncoming traffic; never walk with the traffic. This is the law in most states and it is in place for good reason. If a vehicle is coming towards us, we will see it. If the driver doesn’t see us, we will have a good chance of moving out of the path of the oncoming car. Crossing to the other side and walking in the same direction as the traffic prevents us from seeing or hearing approaching traffic from behind. Tips to make walking safer. When walking on a road, we walk at a time other than rush hour. Thirty minutes sooner or later may make the difference between walking on a busy commuter road and walking on a quiet country road. Carry a cell phone, identification, and a contact name and phone number in case of an emergency. The information should also be on your dog’s tags. Carry pepper spray or a walking stick in case a loose, aggressive dog decides to take on your dogs. If an attack is under way despite your efforts, sometimes unleashing your dogs will cause the other dog to leave or back off and save your dog from bites. This is risky but if push comes to shove and/or you are down on the ground, your dogs will likely stay with you if they feel unthreatened or they can escape if they must. Check the dogs’ collar fit from time to time. (See sidebar.) Dressy as well as simple martingale and buckle collars loosen with time and dogs can back out of them. Check the hardware and fabric on collars and leashes. Defects occur and collar materials simply fail from wear over time. Look for potential rips and breaks about to happen and replace those components. Use the proper leash. “Proper” depends on the situation. A traffic leash is two-feet long and is ideal for walking in crowded areas or on heavily-traveled roads. If something spooks the dogs, we have excellent control with a short leash. For more relaxed situations or in country-like areas, we’ll use a six-foot leash if it feels comfortable and can be wrapped around the hand and made into a shorter length when needed. For a variety of reasons, we reserve the Flexi-Leash for specific training and exercise purposes in secure areas, preferably in our own yard. Walk routes where the neighborhood dogs are usually confined or at least are reasonably friendly. In hot weather, walk when the temperatures are under 80 degrees, ideally in the cool of early morning or evening. We carry a bottle of water for drinking or for spraying on our dogs if it gets warmer than anticipated. In humid weather, 75 degrees may be the warmest safe temperature for walking. Under certain circumstances and depending on the health of the hounds, heat stroke can hit unexpectedly and when the weather doesn’t seem extreme to us. Pavement can get extraordinarily hot and cause burned pads. Best to stay home in the breeze of a fan or, better yet, in an air conditioned house. When the walk is done, we remove the martingale collar. They really are choke collars and are not safe to wear 24/7. Even though our hounds (and cats) are microchipped, they have a loose tag collars as a backup safety net. 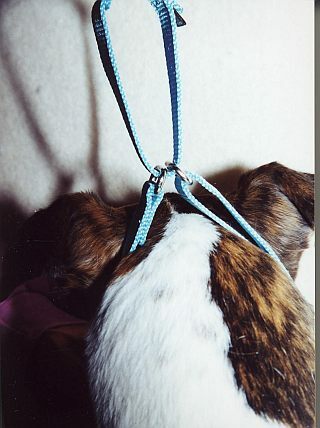 Compare your collars to the right and wrong photos of the martingale collars seen below. 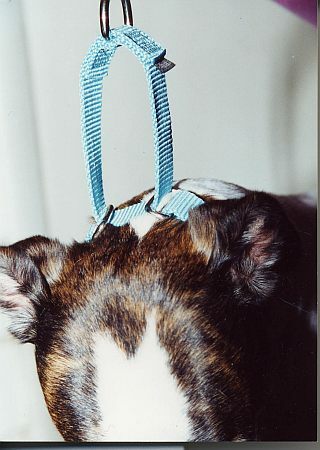 Also, check out the short article A Martingale Collar is only as safe as you adjust it by Ellie Goldstein. Here’s to safe walks! Here I am. You have my permission; thanks for asking! 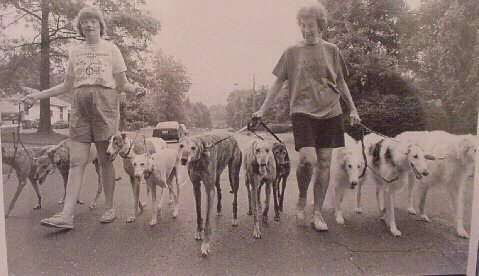 I am trying to get in touch with Marcia Hermann to get her permission to reprint the article walking for our Retired Greyhound Athletes of Northeastern Wisconsin newsletter. Any idea on how to reach her.